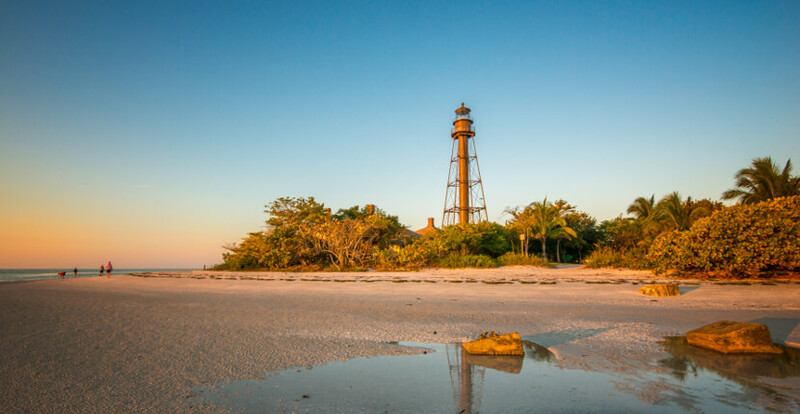 Sanibel Lighthouse is 98 feet tall and was erected in 1884. It was built to mark the entrance to San Carlos Bay. At that time ships regularly brought goods to the port of Punta Rassa and departed loaded with cattle destined for Cuba. The building of the lighthouse did not go easily as the ship carrying the ironwork construction sank about two miles offshore. Hard-hat divers were called in from Key West and they managed to recover most of the pieces. The lighthouse was registered on the National Register of Historic Places in 1974. It is now leased to the Coast Guard as an operational light station and the white flashes have been automated since 1949. The best place to find shells is about five minutes’ walk to the right of the lighthouse. 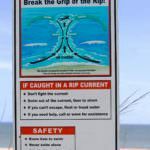 This is probably due to the strong currents that make swimming from Lighthouse Beach extremely dangerous. The beach has a small parking lot that can accommodate 194 vehicles, with a fee of $5 per hour. 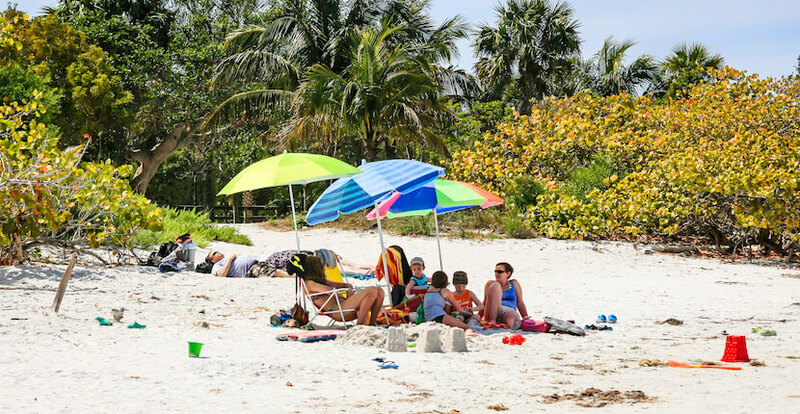 Plan to arrive early to get a good spot on the popular small beach, which can become crowded. 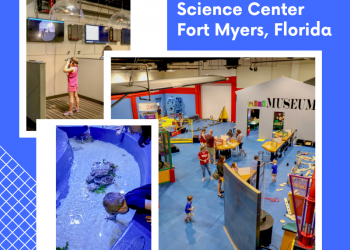 Other facilities include public restrooms, picnic areas with BBQ grills, outdoor showers, and a bike rack. 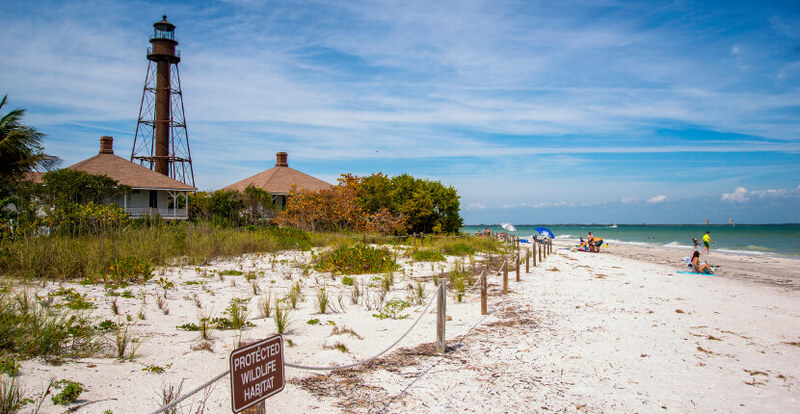 Leashed pets are welcome on Sanibel Island’s beaches providing you pick up after them. 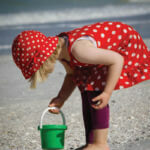 Please don’t bury pet waste…children like to dig in the sand as much as pets. To get to Lighthouse Beach turn left on Periwinkle Way from Causeway Road. 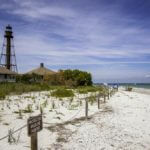 Florida Sunshine Survival Tips blog article. 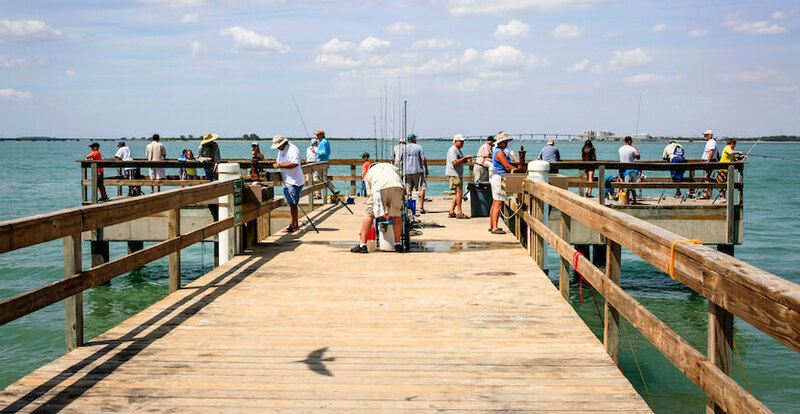 The wooden boardwalk and T-dock at the end of the pier are always busy with anglers and fishing enthusiasts. Popular catches include redfish, snook, sheepshead, black drum, snapper and other species. There are wooden bench seats on the pier and a shelter providing shade, but usually the dock is breezy and cool, even on the hottest summer day. 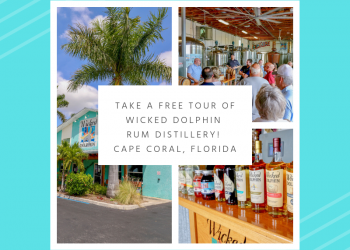 Expect to see dolphins, flying fish, sting rays and shore birds as well as hungry pelicans looking for an easy meal. In winter, ospreys regularly nest in the wildlife refuge nearby. 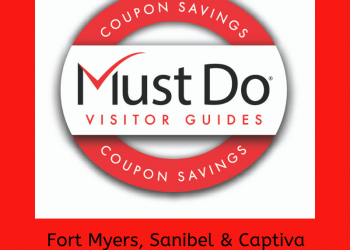 More things to do on Sanibel Island.